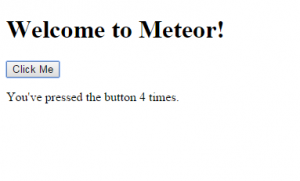 Meteor is a web framework written on top of Node.js. Meteor hooks into Passenger for seamless process launching and flexible, agile scalability. Meteor requires terminal access to use. This guide covers launching Meteor on a v6+ platform. PREREQUISITE: follow the MongoDB tutorial to setup MongoDB. Meteor 1.0.3.1 has been installed in your home directory (~/.meteor). Note: tempting as it may be, do not install the meteor package from npm. The package available is an unofficial fork and has not been removed by the repository custodian. Substitute <HOSTNAME> for your fully-qualified domain created within the control panel. In our example, taking into account the domain example.com and subdomain meteorapp, it is meteorapp.example.com. Substitute <PORT> for the MongoDB port chosen from the PREREQUISITE MongoDB tutorial at the start. Substitute <USERNAME> for the username that you logged into the control panel with and where Meteor was installed. This is your home directory. Access your Meteor install through the web site. The first request will take several seconds to initialize and connect to the database. Once initialized, subsequent requests will be much faster (and have a 95% chance of vaporizing from exceeding terminal velocity). Meteor piggybacks Passenger, and in doing so, can be easily restarted using the tmp/ control directory. Follow the general guide to restarting a Passenger-backed application. Official Meteor tutorial – skip install steps! This entry was posted in Guides, Node and tagged advanced, frameworks, nodejs, passenger, yolo.